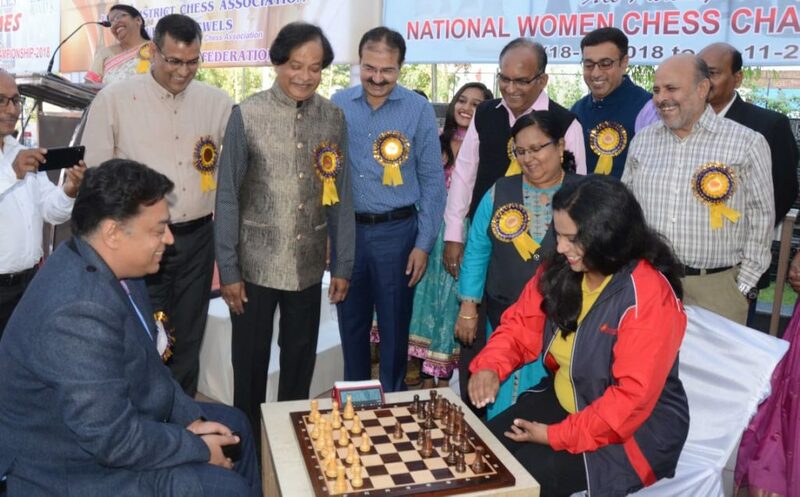 National Women Chess Championship was inaugurated by Sri. Naveen Jain, Senior IAS, Jaipur who made the 1st move against seven-time National Women Champion IM Vijayalakshmi S, Air India, at The Diamond, Urbana Housing Society, Jaipur on 18th November 2018 in the presence of Sri. P S kanawat,Senior deputy Accountant General, Rajasthan, Sri Ashok Bhargava,Secretary All Rajputana Chess Association and the President of Jaipur District Chess Association, and Sri Sunil Bhargava , Secretary of Jaipur District Chess Association. This Championship attracted 112 players from 20 states, 2 Union Territories and 4 special units which included 2 IMs, 6 WGMs, 7 WIMs and 7 WFMs. IM Vijayalakshmi S (AI) was the top seed with the rating 2365. All the top seed players sailed smoothly to the 2nd round.